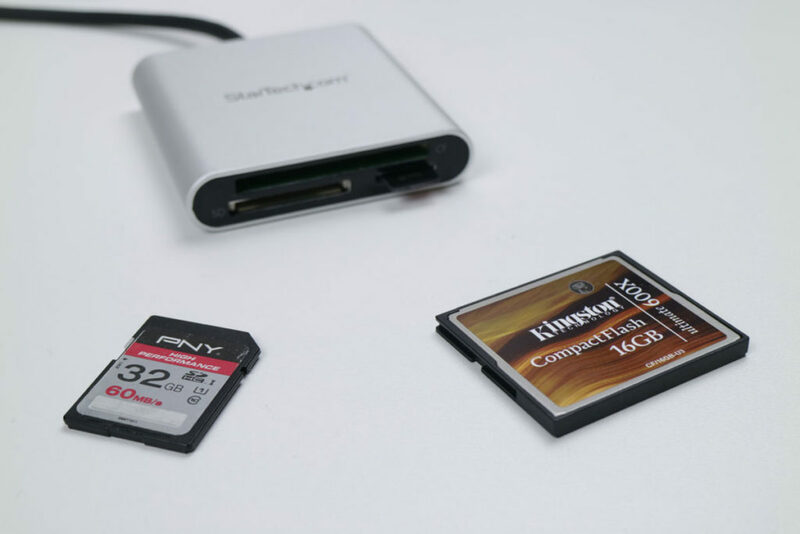 My quest for the perfect USB-C multi-card reader continues, and this time I’m looking at the exhaustively named USB 3.0 Flash Memory Multi-Card Reader and Writer with USB-C -SD, microSD, CompactFlash. I’m not kidding, this is actually written word for word on the box. Fortunately they’ve nicknamed it FCREADU3C for short so I don’t have to type that out every time I mention it. What drew me to this particular reader first and foremost is the CompactFlash slot. As a semi-professional photographer (both for my blog, my job and the odd bit of product photography) and user of a Canon EOS 7D, I often have to dump large batches of photos from a CompactFlash card, making this slot an extremely useful addition even though it’s not absolutely essential (the camera itself serves as a reader). 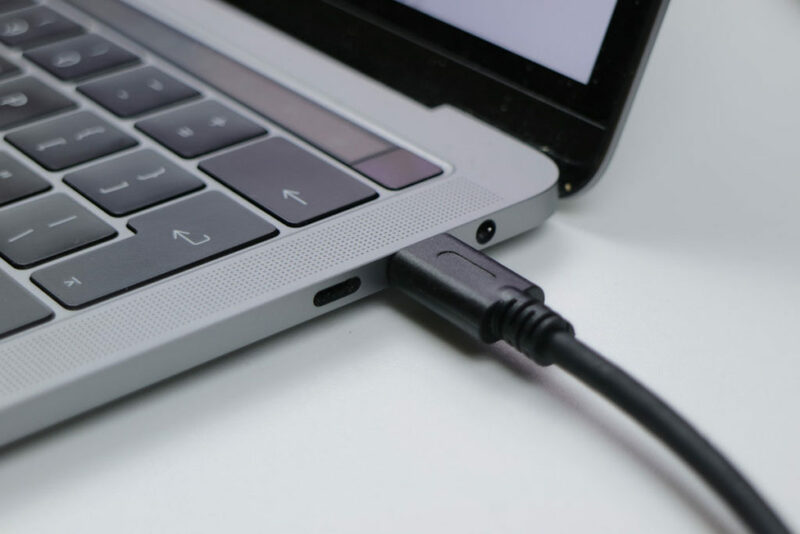 It also includes a short USB-C cable (physically attached to the device, and called “captive” by the specification) which I much prefer to the fixed connector solution in products like the ProMate MacHub, which I also reviewed recently. Much like many similar products from StarTech at the moment, the FCREADU3C is constructed from an extruded aluminium shell which is easily 1mm thick or thicker (my cheap callipers have run their battery out again, ugh). The front and back plates are also aluminium, giving it a ridiculously durable build that will probably outlast USB-C, if not the card slots themselves. They’re also coated with a thick black plastic to give a glossy black finish to the front and back, contrasting the aluminium. The rear plastic coating serves to hide the screws that hold the internals in place, giving it a tidy, minimal and seamless finish. Despite being quite large, it’s surprisingly light, but considering it’s mostly air inside this isn’t unusual. Prying the adhesive plastic off the back and undoing the two screws yields a PCB that fills the whole enclosure from edge to edge, slotting securely into the extruded aluminium with very little wiggle room. The thick USB cable doesn’t have a loop for strain relief, but seems fairly securely fixed into its rubber grommet so I’d be surprised if this is ever a problem. There are only two chips inside the reader, one is an Pm25LD0010 – a small amount of flash memory, presumably a buffer chip, and the other is a Realtek RTS5309 (actually specified in StarTech’s own datasheet) which does all the heavy-lifting. The biggest problem with FCREADU3C is that it’s mutually exclusive; you can only use *one* of the card slots at any one time. This isn’t a deal breaker, but can be interesting if you’re absent-minded. If you accidentally forget and try to plug a second card in, your first card will spontaneously unmount. 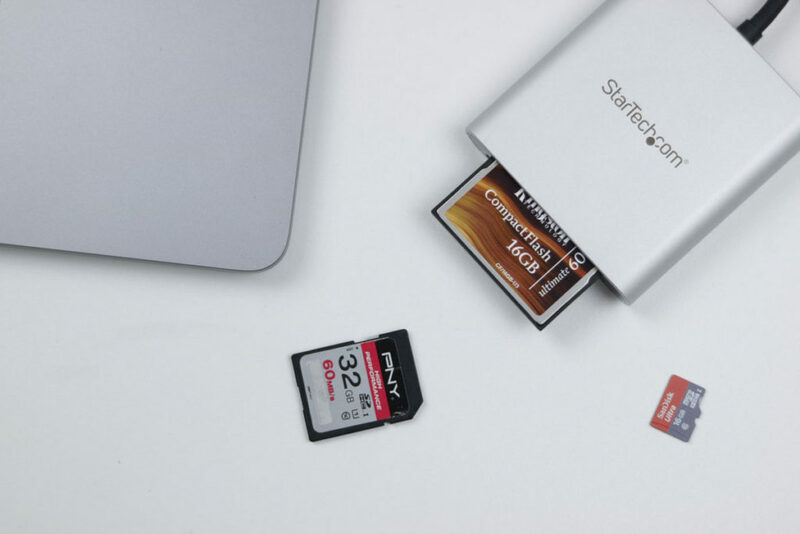 At least that’s the behaviour I observed with permutations of microSD, SD and CompactFlash. 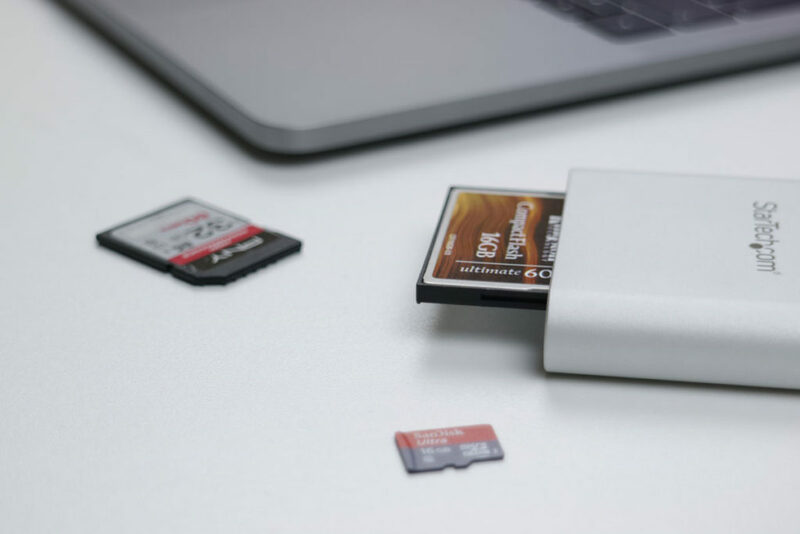 At £42 the FCREADU3C is on the higher end of the USB-C card reader spectrum, but not by much. It’s also the only reader I could find with a Compact Flash slot. This is either because it’s the only one that exists, or because it’s really quite difficult to Google “compact flash” and get sane results these days (please, if you can prove me wrong I’d love to test some alternatives!). Although it’s a little worse for wear from me prying it open, I’m pretty confident it’ll last. I guess I’ll know in 5-10 years when I drop in to update this review 😉 I’m still using the SandBerg Multi Card Reader I reviewed back in 2008, although the plastic finish has gone a little sticky. Overall, it’s a great product. Despite being a little on the large size it’s durable, looks good and supports the three card formats I actually care about. The aluminium enclosure will keep it in tip-top condition for years, sidestepping the discoloration and stickiness that plastic often faces. This entry was posted on Tuesday, January 17th, 2017 and is filed under Featured, News, Personal Computing, USB Type-C and Thunderbolt 3.